Staff Sgt. 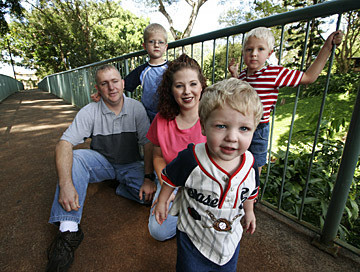 Carl Barton, his wife, Amanda, and sons Dakota, 7, Blake, 22 months, and Logan, 4, moved to Schofield Barracks from North Carolina, but their belongings are believed to be in a New Orleans railyard flooded in the aftermath of Hurricane Katrina. The family of a Schofield Barracks Army sergeant learned last week that they are victims of Hurricane Katrina -- even though they were nowhere near New Orleans when the storm hit on Aug. 29. Staff Sgt. Carl Barton, his wife, Amanda, and their three boys have been living with borrowed furniture and few of the children's favorite things since they arrived on Oahu in late September. The shipping container that was supposed to arrive in Honolulu Sept. 28 with the Barton's household goods from Fort Bragg, N.C., is believed to be at a New Orleans railyard that was flooded in the aftermath of Katrina. Added to the stress of their lost possessions is that baby Blake has a rare condition, intractable pain syndrome, that gives him painful headaches, stomach aches and recurrent episodes that resemble epilepsy. Until Oct. 14, the Bartons knew only that their goods had been "delayed by hurricane." They assumed that their stuff was safe and dry, just part of the general backup of shipping caused by Katrina, and exacerbated by Hurricane Rita three weeks later. Now they're not sure when they'll get to see their things, or if they are salvageable. Staff Sgt. Barton, 29, called the situation "an inconvenience" yesterday, while Mrs. Barton, 28, was more emotional. "That's my whole life in 10 huge crates," she said yesterday in Wahiawa, wiping away tears. Besides furniture and appliances accumulated over their nine-year marriage, there are personal items that can't be replaced, such as a hope chest that belonged to Mrs. Barton's grandmother, the only video recording of the couple's wedding and a little blanket that oldest son, Dakota, gave his dad to "keep him safe" during eight months in Iraq. Mrs. Barton recalled that as the family was packing for the move in early August, 4-year-old Logan was worried about people taking his stuff away. Seven-year-old Dakota assured his brother that their toys, including space ships and Star Wars figures, would meet them in their new home in Hawaii. "We're a military family. We're used to moving and we know sometimes you're going to get a few broken things (in the move)," she said. She's still hoping that the railcar their containers were in didn't get flooded and their things will return to them unharmed. But the unlikelihood of that is beginning to sink in. If their goods are ruined, the Bartons have to go through the tedious process of putting insurance values on the items by pricing similar goods in stores. The family has "maxed out credit cards" buying things for their new Schofield Barracks home, Mrs. Barton said. "My husband said to me, 'You know what? I feel helpless for my family. You don't want to look needy and you don't want to beg,' " Mrs. Barton said. "We've always made it on our own." The family applied for disaster relief assistance from the Federal Emergency Management Agency, but was denied, Mrs. Barton said. She credits her husband's unit for the loan of furniture and has been amazed at the kindness of people who have helped out, including neighbors and her sons' teachers. The family will make it through, with or without the return of their own things, Mrs. Barton said. "It has made me realize that this storm was bigger than anything I can control," she said. "It's really awesome that someone cares about us." During a decade in the Army, Barton has been stationed in Fort Drum, N.Y., Fort Polk, La., Korea and Fort Bragg, N.C. He has been on missions to the Sinai Peninsula and to Iraq and is scheduled to return to Iraq next August. Two days before Katrina hit New Orleans, the train with the Barton's stuff on it got to a railyard there, said B.J. Armstrong, president of AA Sound Forwarders Inc., the mainland firm the Army hired to move the Bartons. "Local authorities wouldn't allow us to get into the railyard and it's been sitting there ever since," Armstrong said. "When I spoke to Staff Sgt. Barton, I assured him that the condition of his household goods and the morale of his family was utmost on our minds."